Patrick Reed is currently living the dream. 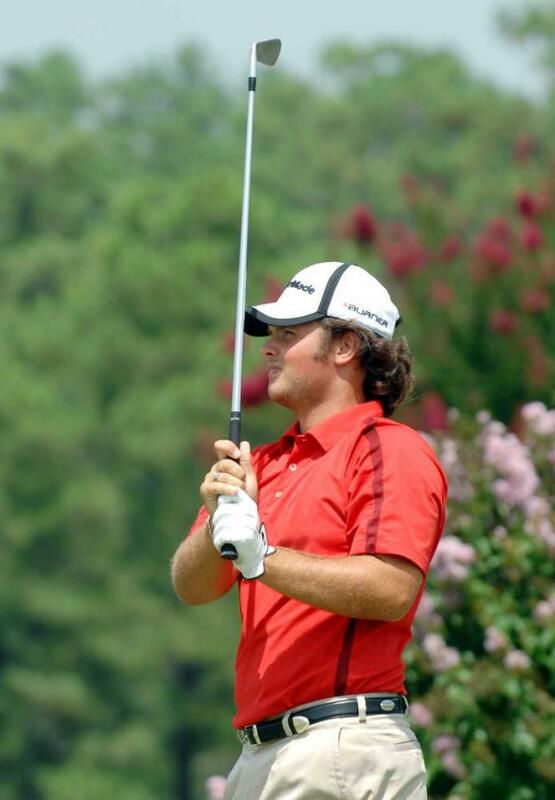 After leading Augusta State to the NCAA Men's Golf Championship, Patrick Reed decided to forego his senior season to try to make it professionally. The 21-year-old from Texas has no status on the PGA Tour or Nationwide Tour, which means he is technically unemployed and has to qualify for tournaments if he wants to play in them. This last January, he played and won a pro-am tournament in Tobago earning him $25,000. When he returned to the United States he asked his girlfriend, Justine Karain, to marry him. Justine was working as a registered nurse but decided to sacrifice her career, travel with her soon-to-be husband, and become his full-time caddy/driver/support system. During his qualifying round, he was added to the tournament because a player withdrew and he was the first replacement on the list. He finished T-35 and received a check for $22,915.00. After finishing at the Valero on Sunday in San Antonio, TX, Reed and his fiancee drove nine hours to New Orleans. They arrived at 3 in the morning, had four hours sleep, then teed it up for his qualifier. He shot 4-under, including a birdie on the first playoff hole to earn one of three available spots in the Zurich Classic. He finished T-24 and received a check for $51,840.00. With his earnings, the couple chose to fly to the next PGA tour event in Charlotte, NC. Routed from New Orleans to Chicago to Greenville, SC, the couple didn't make it to their hotel until after 1:00 am. During this qualifying round, Reed needed to birdie the 18th hole to avoid being forced to play in another playoff. He saw the putt one way, Justine saw it another way. But as we all know, the woman is always right -- so he went with Justine's read, made the putt, and the rest is history. He finished T-32 and received a check for $34,450.00. He did it again. Patrick Reed notched 8 birdies en route to a 8-under 64 round, finishing three strokes clear of the other qualifiers. As a result, he will be participating in the Byron Nelson this Thursday. This is the fourth straight tournament he will be partaking in, and he needed to play his way into all four of them. In the last month, he has made a total of $109,205. If he can continue his inspring play, he has the opportunity to make more and maybe earn a spot on the tour in 2013. To earn an exemption for the 2013 Nationwide Tour, he will have to earn around $170,000 during this playing year. And for the 2013 PGA Tour, he needs to finish in the top 150 on the money list to qualify for a special temporary membership which would allow him to accept sponsor exemptions to 12 tour events. Last year, that number was at $571,000. No doubt, he is close to reaching his dreams. I just hope he is enjoying the ride, loving his soon-to-be wife, and making lots of memories along the way. We've all heard of the Tiger Woods, Rory McIlroys, and Rickie Fowlers of the world but it's little known, Patrick Reed, who has really captivated the tour this year. Patrick Reed is living the dream.